Paul Feiler was born in Frankfurt-on-Main, Germany. He came to England in 1933 and from 1936 to 1939 he studied at the Slade School, and between 1941 and 1946 taught at Eastbourne and Radley. 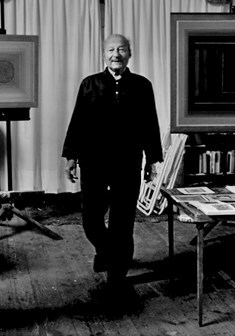 He came to the West of England College of Art in 1946 where he stayed until 1975 during which time he became Head of Painting. In 1949 he first visited Cornwall and in1953 bought a chapel at Kerris, Paul, near Penzance which has been his home ever since. The studio had been Stanhope Forbes’ first studio in Cornwall. His early work was inspired by the landscape of Cornwall and influenced by Abstract Expressionism: "I have always enjoyed writing down with paint what I felt the world around me looked like. This has been a limited world: a world of open spaces with snow and ice-covered mountains; later, the sea and the rocks seen from a height." (Paul Feiler, 1957) He has had numerous solo exhibitions including several at the Redfern Gallery in London, from 1959 to 2000; Arnolfini Bristol in 1961; the Richard Demarco Gallery, Edinburgh, in1969; the John Hansard Gallery in, Southampton in 1982; the Warwick Arts Trust, London in 1982 and a retrospective in 1995/6 at the Tate Gallery, St Ives - these mark only a handful of solo shows. Group exhibitions include The Bristol City Art Gallery in 1950; British Contemporary Paintings at the Arts Council Gallery in London in 1953; the Tate Gallery in 1954; the John Moore’s in Liverpool in 1961; the New Art Centre London in 1977; St Ives 1939–64 at the Tate Gallery, London in1985; Austin Desmond Fine Art in 1989 and several group exhibitions at the Redfern Gallery in Cork Street. His work is represented in collections in Austria, Canada, France, New Zealand and the USA as well as many key collections in the UK such as the Victoria & Albert Museum, the Tate Gallery, London, the Arts Council of Great Britain, Kettles Yard Museum, the Birmingham Museum and Art Gallery amongst others.